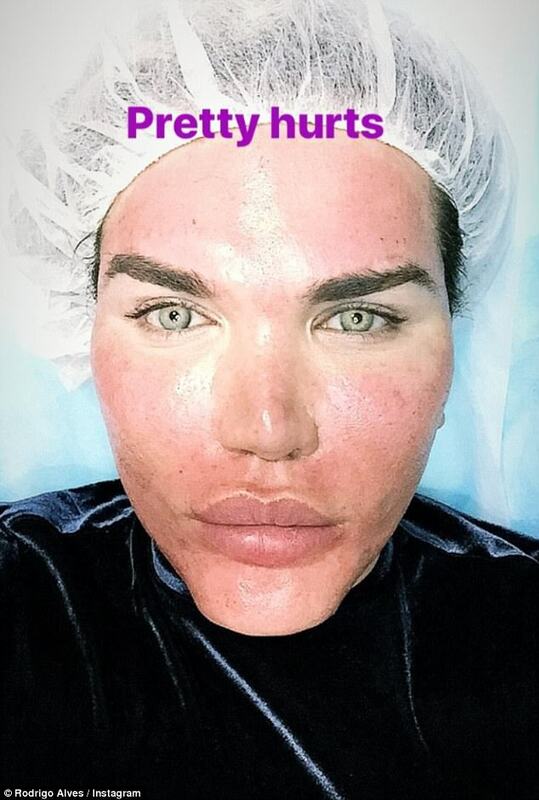 Brazilian Surgery addict, Rodrigo Alves, 34, popularly known as Human Ken Doll has undergone another procedure to help him look ageless. He went through a chemical skin peel procedure that involves applying an acid-containing lotion to the face, letting it soak through and then peeling off the old skin to reveal fresh new skin in its place. Speaking exclusively to MailOnline, Rodrigo said: 'It was fairly painful, and my face looks red now. It feels like burning! Here in Marbella is very sunny and I can’t go out for the next few days unless I have a lot of sun protection! He added: 'I would never let myself go and no one will ever see any wrinkle on my face. Some men think that only going to the gym and looking muscular is enough. I believe that men should also look after their faces with night cream and make-up just like I do. Earlier this month, Rodrigo revealed plans to have six ribs removed in what would have be his 60th cosmetic procedure, but it's yet to be done as doctors feared his lungs would collapse.